^^yes, it seems like all kinds of cheap tricks are allowed in the USA to make it easier for the big corporations to sell more crap and to make more profit. All at the expense of the average Joe. This is also a global problem. E.g. for vegetables: It matters what the tomato looks like if it should sell. If they can make them stay solid and bright red for longer at the expense of the nutritive value then they will do it. I think lots of health care costs could be saved if there would be less trickery in the food. 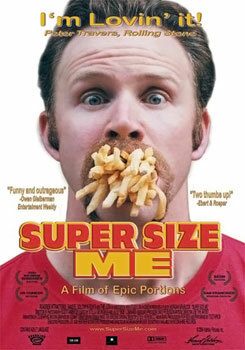 Three words: "Super Size Me"
Gotta be careful with what you put in your mouth. In the most comprehensive sense in which that sentense can be taken. If anything, I think this would be a wake up call for all of us to have physical. Planning on running in the mornings the coming Easter Holidays. I'm not overweight but I'm close to being at risk of it. I kinda make a point to do some physical training on my own. It's kinda odd, just a few weights and a gym session later for a month, people thought, "Wooo, what happened to you? Back to the army again? You looked beefed up!"